In last month’s article, I mentioned the use of social media by governments and how quickly sites such as Facebook are becoming the new platform for the public sector to communicate with the community. Police agencies post pictures of inmates, local governments display town hall events and citizens interact with policy officials on Twitter on a daily basis. The idea for government is to create an online network for their constituents to access. Today, governments across the world have developed new platforms for online usage. In my home country of Canada, a network called Connect2Canada was developed in 2005. The network was developed for citizens of Canada living in the United States. According to the website, over 50,000 people have joined the network. Users can also use Facebook and Twitter to stay update about the network. In the United Kingdom, the government teamed up with Facebook to create a dedicated space for users to come up with ideas on how to create savings in public spending. According to Number10.gov.uk, the first phase was open to public sector workers, to get their professional insights and views on everything from how to cut back on wasteful spending to how to radically change the way services are provided. This second phase is different to the last. They not only want people’s ideas, but they also want to hear what people thought about the ideas that are put forward. This social network is now transforming the way government is interacting with the people. In the past, people would send letters to their representatives asking for assistance in their communities. Now, governments are reaching out to the public to ask for their opinions on how it should work. I would describe this as an issue of accountability. Now that social network mediums are able to report on the daily activities of the government, there is nothing to hide from the public anymore. There is another side to the conversation of government in social media: persuasion. The idea that government has access to information about its citizen’s also means they can influence the community it serves. This is the ‘flipside’ of Internet freedom. Governments now patrol websites for information regarding activities citizens engage in. A few years ago, the Obama administration devised legislation that would allow the government to listen in on all your Internet communications — Twitter, Facebook, Skype and others. The administration, under this telecommunications legislation, would require all companies with products allowing Internet communication to build in a back door to their encryption. That way the government could quickly monitor conversations, especially when the comments about government policy are negative. In Canada, the government is now monitoring Facebook and chat rooms to see what comments are made by everyday Canadians. The next time you post an opinion in an online forum or a Facebook group message board; don’t be surprised if you get a rebuttal from a federal employee. Bureaucrats all over the country have accounts and can specifically look at what a person post and issue an immediate statement. The Prime Minister calls this move an active way to get Canadians to interact with its government, although I observe this as a bad attempt of government monitoring. Imagine the United States government conducting such a policy here in this country with a population of significantly higher users of Facebook. According to Richard Rosenburg, president of the BC Freedom of Information and Privacy Association: The government has a lot of power that it feels the need to monitor public bulletin boards, or places where people express views and then to respond to that, seems to me going beyond a reasonable action the government should be taking. Well, it is not hard to imagine actually. In the post 9/11 era, there has been aggressive monitoring of websites. It is not hard to assume that there is also monitoring of social network platforms. In response to a Freedom of Information request (FOIA), the government released documents revealing that social networking sites are being heavily monitored. According to the report by the Electronic Frontier Foundation, social sites like Facebook, Myspace, Twitter and Flickr were targeted, as well as Wikipedia, Craigslist, many political commentary sites, and NPR, among others. 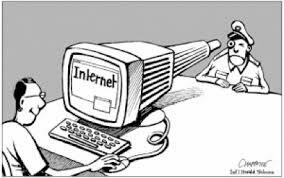 It is obvious that with more a government presence on Facebook, it will lead to more intrusion by government agencies. Of course, government has to keep up and active with the activities of its citizens, especially when they may be saying negative things. The question is whether it is worth sacrificing the rights and freedoms of everyday citizens. Author: Andrew R Vaz, M.S., M.P.A. is a doctoral student in Public Policy and Administration program (PhD) at Walden University. He is a graduate of the Master of Science in Criminal Justice and Master of Public Administration program at Florida International University. He can be reached at [email protected].